Mandarin Palace online casino offers games from Saucify (BetOnSoft), which means that you will find some less common games on this platform, so there is lots of new titles to enjoy. Several new games show up on a monthly basis, so you are always in for a surprise. In this Mandarin Palace Casino review we will go through everything you need to know about the casino. Mandarin Palace Casino opened up in 2009, operated by Genesys Technologies NV. 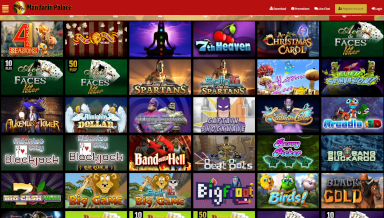 Today their mobile casino have over 60 games to offer. Their payout ratio is very pleasing at 97% and they offer new promotions on a daily basis. There are plenty of bonuses available at this generous casino, which clearly understands that modern casino players need to be appreciated if they are going to stick around. And when we say appreciated, we mean that there need to be regular bonuses and other exciting promotions available. New players are able to take advantage of several welcome Mandarin Palace Casino bonuses, which gives a total up to $2,250. The first deposit comes with 100% sign up bonus up to $500. 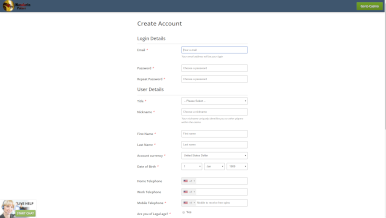 First you have to register an account and login to the casino. The second deposit comes with a bonus of 75% up to $625, and the third gives you 100% bonus up to $500. Not enough? Do not worry. 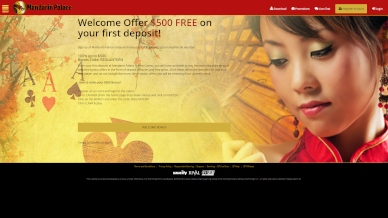 There is also a fourth deposit bonus, which gives you 125% in bonus money up to $625. At Mandarin Palace Casino UK it is possible to get free spins every single day. That is because all depositing players get 50 Free Spins during the casino’s happy hour. Every day between 6.00 am – 9.00 am EDT, players get 50 Free Spins to play during Happy Hour. 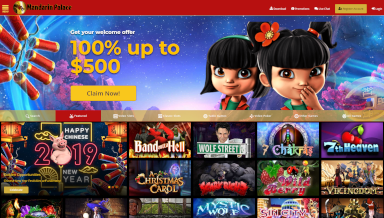 And they are even more generous than that, because if you redeem 7 Happy Hour offers over seven days in a row, you automatically enter a lucky draw where you can win vouchers, gift baskets, bonus money or more free spins. The casino offers games from Saucify, Rival and Betsoft. Some of their most popular games right now are Mystic Wolf, Wishing Cup, Age of Spartans, Wolf Street, Band outta Hell, and Vintage Vegas. 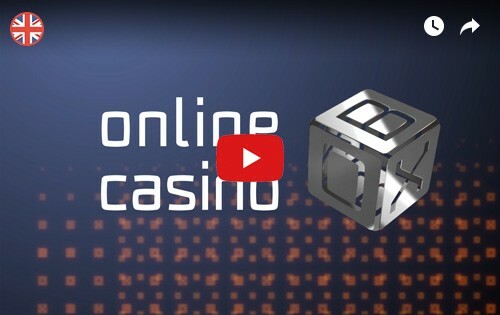 This casino offers all important features, like secure payments, dedicated customer service and several different games types. At Mandarin Palace Casino you can play Video Slots, Classic Slots, Table Games, Video Poker, Keno, Scratchcards, and Superkeno. The wide variety of video slots include Swinging SweetHearts, Silver Unicorn, Thunderbird, Small Soldiers, Stampede, Road Trip Route 66 and Sirens Serenade. Mandarin Palace Online Casino offers withdrawals and deposits with MasterCard debit, credit, Prepaid cards and gift cards. You can also use Skrill, ecoPayz, Neteller and Bitcoin at Mandarin Palace Casino. The currency varies depending on what country you are in. Transactions are processed in $, €, CAD, £, Norwegian NOK, Danish DKK, and Swedish SEK, so you will have no problems with your Mandarin Palace Casino withdrawal. This casino offers support all around the clock, so whenever you need help with something, help is there. Contact the support team via live chat, telephone and e-mail. There is also a FAQ available for quick ready-made solutions. Some of the restricted countries and continents are Asia, Australia, Brazil, France, Ireland, Italy, Japan, Mexico, Netherlands, Romania, Russia, South Africa, Spain, United Kingdom, and United States. Mandarin Palace Casino mobile is available for all smartphones and tablets from the big brands, like Android, Apple and Sony. Login anywhere, anytime, and play your favourites whenever you feel like it. The biggest pros with this casino is their many generous promotions and unusual casino game selection. It is also wonderful that they offer dedicated customer support. Although we are missing out on some game providers, there is still lots to choose from. To summarize, this is a very enjoyable casino that has a lot to offer, and they have chosen a refreshing group of software developers for their portfolio. Why not take advantage of their welcome offer and see if this is a casino for you.